Ice, Death and Fury comes to Midgård! The most overpowered and irresponsible wizards known to fantasy are back! 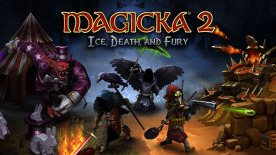 In this second DLC for Magicka 2 you will experience more spells, outfits, missions, enemies and co-op fun then you can wave a wand at! Death Apprentice Robe, Grimnir Reaper Staff and The Dead Mans Hand weapon. Scavenger Robe, Staff of Detection and the Ol’ Trusty Rusty Revolver! Robe of Riviera, a Crow Staff and a Silver Longsword.